University Press of Mississippi, 9781617037962, 278pp. 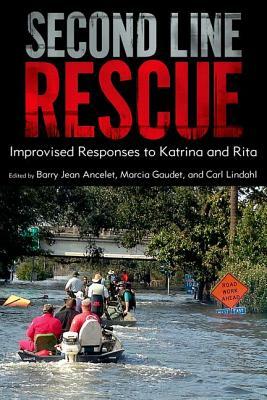 Second Line Rescue: Improvised Responses to Katrina and Rita chronicles the brave and creative acts through which Gulf Coast people rescued their neighbors during the chaotic aftermath of Hurricanes Katrina and Rita. Ordinary citizens joined in with whatever resources they had. Unlike many of the official responders, vernacular rescuers found ways around paralysis produced by a breakdown in communications and infrastructure. They were able to dispel unfounded fears produced by erroneous or questionable reporting. The essays, personal narratives, media reports, and field studies presented here all have to do with effective and often ingenious answers that emerged from the people themselves. Their solutions are remarkably different from the hamstrung government response, and their perspectives are a tonic to sensationalized media coverage. The first part of the collection deals with Gulf Coast rescuers from outside stricken communities: those who, safe in their own homes and neighborhoods, marshaled their resources to help their fellow citizens. It includes some analysis and scholarly approaches, but it also includes direct responses and first-hand field reports. The second part features the words of hurricane survivors displaced from New Orleans and other Gulf Coast communities to Houston, Texas. In many cases, the "victims" themselves were the first responders, rescuing family, friends, and strangers. All of the stories, whether from the "outside" or "inside" responders, reveal a shared history of close-knit community bonds and survival skills sharpened by hard times. This book is about what went right in the aftermath of Katrina and Rita--in spite of all that went so wrong.